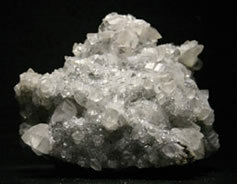 The specimen shown at right is manganocalcite. It is from Ma Nao Shan, Hunan Province, China. Under regular light the specimen has a clear to milky white appearance. 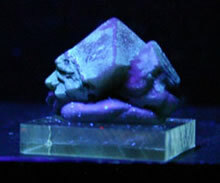 Under long wave ultraviolet light the specimen fluoresces a pinkish-red. The photos at the far right show a red-orange fluorescence under short wave ultraviolet light. 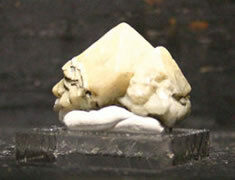 The second row specimen is a "Pagoda" calcite from Leipingzhen Guiyang, Hunan Prov., China. Under normal lighting the crystals are clear to milky white. 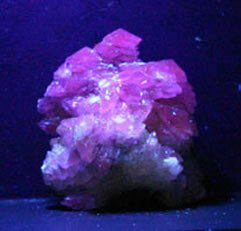 The specimen is a lavender pink under long wave UV light. Under short wave it appears as a more reddish pink. 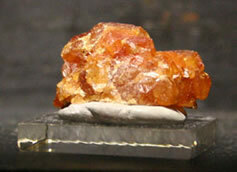 The third row specimen is calcite from the Fozi Chong Mine, Guangxi Zhuang AR, China. 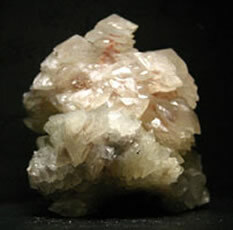 The calcite in this specimen is clear to milky white under normal light. 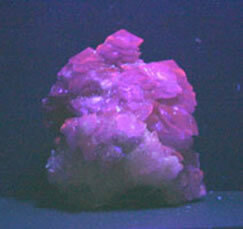 As with the previous specimen, the long wave fluorescence is a lavender pink and is reddish pink under short wave ultraviolet lighting. 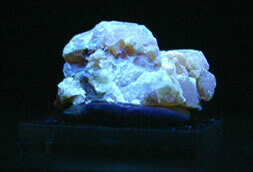 Our next row of specimens is manganocalcite and quartz from Shimen, Hunan Province, China. 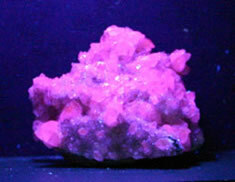 It fluoresces a pinkish red under long wave UV lighting and red-orange under short wave UV lighting. The purple of the quartz and matrix is the fluorescent lights reflecting off the light colored matrix. The next row of photos is scheelite, arsenopyrite, fluorite, and quartz from the Yaogangxian Mine, Hunan Prov., China. 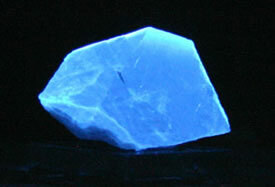 The scheelite is the only mineral in this specimen that fluoresces. 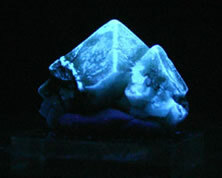 The small fluorite crystal to the left of the specimen does not fluoresce. The purple you see is the reflection of the UV light off the light colored minerals in the specimen. The row of photos to the right are of sheelite from Rucheng in the Hunan Province of China. 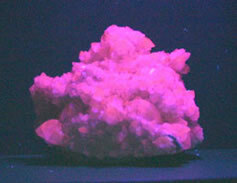 Typically sheelite does not fluoresce under long wave ultraviolet lighting. This particular specimen does and we therefore felt it would be a nice addition to this application. The fluorescence under long wave is not quite a bright as it is under short wave, but is still significant enought to be shown here. The next specimen is also sheelite. It is from th Yaogangxian mine in the Hunan Province of China. We included this specimen because it is a larger single crystal of sheelite with no other included matrix and it does fluoresce brightly under short wave ultraviolet lighting. 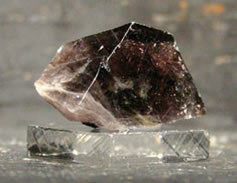 The next specimen is a group of sheelite crystals with no accompanying matrix. The specimen is from Pingwa in the Sichuan Province of China. We included this specimen here because it is nice to include specimens of material from different locations. As you can see from the four specimens presented here, they all appear to be different under normal lighting conditions (except specimens one and two). No long wave photo available.